I am so excited to get to introduce my friends and readers to this week’s Wednesday Wife! Cassie and I only know each other virtually, but we are walking a similar journey. In fact, Cassie and her husband, Ryan, are expecting their first baby soon after our Baby B is due! Cassie is also a marriage blogger over at True Agape. She offers lots of great marriage advice, creative ideas, and resources to help you strengthen your marriage. Definitely check out her blog after you read this! I hope you enjoy getting to know Cassie and hopefully learn a little about communication within your marriage along the way. Please remember that when we share like this we are leaving ourselves vulnerable. This is our chance to love on Cassie and Ryan. Please make sure to leave a comment thanking her for sharing or letting her know how her story has encouraged or comforted you. 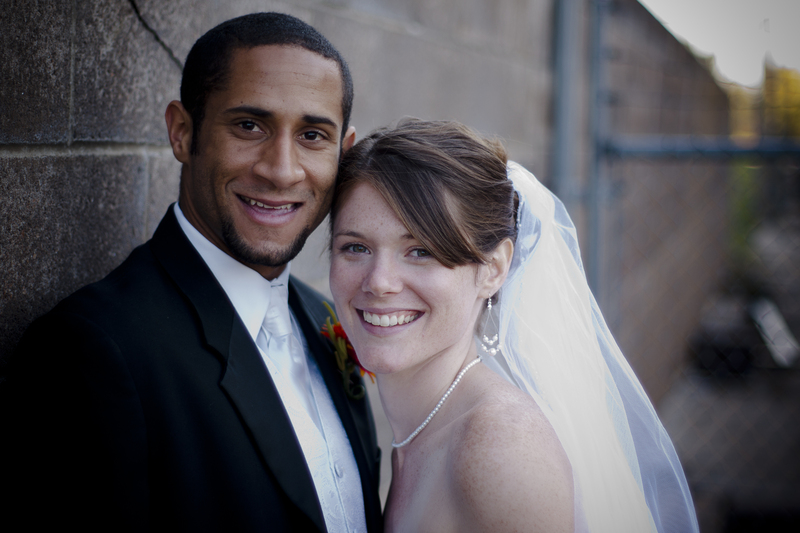 Cassie Celestain married her husband, Ryan, on October 29, 2011. Ryan and I chatted for a while on Facebook and ended up meeting up the next evening. We literally talked for hours that night and about some really deep stuff. From there we started dating. In September 2011 Ryan and I went to Switzerland where Ryan raced in the World Championships for dualthon. That is where he proposed! Since so much of our relationship was surrounded by racing we decided to compete in the race we met at and then get married a few hours later with a running themed wedding. The only issue was that was only 7 weeks away! We planned our wedding in 7 weeks which was actually pretty simple. It was the best day ever! From the day that we met up and talked for hours, I felt like Ryan really understood me. My mom has always said I was “beyond my years” and always had a hard time finding people that understood my beliefs, desires, morals, and just me in general. With Ryan I felt like I could be completely open. I didn’t have that feeling of needing to be artificial. Every time we were together I felt completely accepted and loved. It is a feeling that I have never had before Ryan entered my life. I would say for sure the same as above. The biggest thing in our marriage is being accepting and willing. Accepting of thoughts, feeling, and desires and willing to put the other person first when it comes to those things. When both parties are continuing to seek each other out in this way it makes for a very enjoyable and happy marriage! We have a baby on the way! Our little one will be arriving in this world in early July. There has not been big changes yet in our marriage because of pregnancy. However, I would say the biggest difference is Ryan being in tune to my different needs. He is considerate of my fatigue. He discusses and listens when it comes to topics about the pregnancy and baby. Mostly, he has done great at helping reassure me in areas that I need it in through this time of change. The greatest trial really started at the beginning of our relationship, not marriage. I think for the both of us we had relationships that had failed previously because we were not accepting and willing. A lot of this comes through in communication or lack thereof. For me in the beginning it was making the effort to change my communication style. In previous relationships if I was to get frustrated I would try to deal with it internally, but it would build up. I made a conscious choice that if ANYTHING bothered me I one had to evaluate it and two bring it up. If something is bothering me and it lasts for more than a day I know I need to talk to Ryan about it. Having this kind of communication from the beginning has helped us not have these verbal attacks after weeks/months of built up emotions. Ryan on the other hand is more of a procrastinator. Or we also say he does well under pressure. Which is actually very true! He works with deadlines and gets things done in that way. I knew early on that if I was not careful I could become a nagger. I would want him to get things done at my speed or in my time frame. I could easily continue to mention something over and over until it just irritated him to the extreme. I was reading a section in the book For Women Only when it talked more about this. It really helped me to let go of being aggravated that he doesn’t work at the same speed as me. We are different in that way and it is okay! I have always been a person that tends to take care of others. I just enjoy it. So becoming a wife really came easy to me. It is easy to care for someone you love so much. The not so easy part was changing in the way of being vulnerable. When you enter marriage with your best friend (like no other best friend you have ever had) and you love them more than you could ever imagine yourself loving someone, you have to be vulnerable. That was a bit of a change for me. I had always safeguarded certain topics or feelings. But now this man knows EVERYTHING about me and has the ability to crush my heart and soul in a matter of seconds. That was a change! Good news is as I mentioned early from that first conversation I felt different with Ryan. I have always felt safe. Only rarely when the devil steps in do I ever feel like Ryan could crush my heart. I quickly dismiss those thoughts with positive thoughts and prayer! With our schedule, dates are typically early instead of the evening so we call them “date mornings” or “date afternoons.” 🙂 We will often go to a matinée movie, or do a run or bike ride together. We also do a lot of things at home: watch Youtube videos, try new things like origami or cook dinner. Busy body makes for a busy brain: When I have a lot of projects going on it makes my thoughts very busy. Then when we do have time to spend together I often have to work on putting those aside to pay attention to us rather than just being there. Creating lists so I don’t have to remember everything helps with this. Ryan’s training schedule: We are on the journey of Ryan becoming a professional triathlete. This means on top of his full time job he trains at least 20 hours a week. He works out about 3 evenings a week and has long (2-6hrs) workouts on Saturday and Sunday. For us this is a lifestyle and we have choose this. However, sometimes it does feel like it takes away quality time. We work very hard to stay on a schedule so that we know what time we have available, but also we make sure to eat dinner together every night. This allows us to connect daily no matter the schedule. We both have our own communities that we spend time with such as the women’s bible study group and neighborhood association for me and Ryan’s friends that are athletes or his mastermind group. I believe for us these communities give us support outside of each other which is crucial. We also together will go out with other couples or to learning events. Each time we leave a place we have a discussion on what we learned, a person’s outlook, or how we can implement things into our life. Outings like that help stretch us as a couple past where we currently are. Read The 5 Love Languages by Gary Chapman and then learn how to speak your husband’s Love Language!!! I truly feel like after reading this book most problems in relationships come down to people not speaking the correct Love Language. Chapman talks about everyone feels love differently. However, we tend to “speak” love in the way that we like to receive it which most often is not the same our husband likes to receive it. That then leaves people feeling unappreciated and unloved. When really people just don’t know this concept. It is a must-read!